toys-toys-toys.co.uk: Buying a Present? Let Toyday deliver and wrap your gift for you! Buying a Present? Let Toyday deliver and wrap your gift for you! It's not uncommon for us to find ourselves in a panic trying to find the right gift in time for Christmas or someone's Birthday. Don't worry, Toyday have this covered with our Gift Wrapping Service. If you choose to use our gift wrapping service your present will be wrapped in the appropriate gift wrapping paper, tagged with your message and finished with curled ribbons. 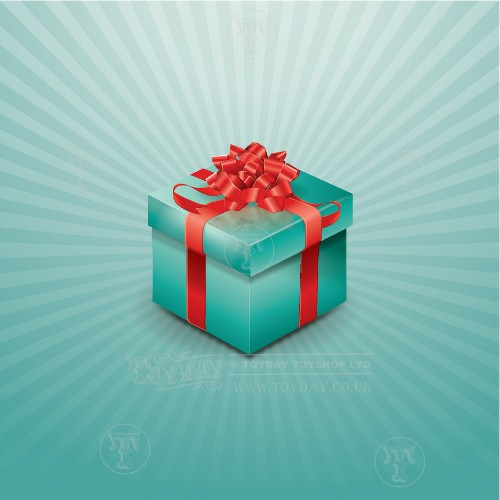 Choose the gender that the present is for, the celebration style and the toy you would like gift wrapped. If you're a little stuck for inspiration then you can use our handy little gift finder on the left of the homepage. Simply adjust the bars to your requirements and click 'Find me a Toy' and a list will appear of all the toys we think would be suitable for your receipt and your budget! We can send it for you too! If you like, you can specify an alternative delivery address when you checkout and we'll send it directly to your recipient. We will not send a packing slip or invoice, just the present and gift tag. We offer a flat rate postage, which starts from £2.95 and is free for orders over £35. If you need your present next day, simply add this giftwrapping option and choose express delivery from the drop down box during checkout for guaranteed next day delivery. The daily cut off is 1pm. Orders placed after 1pm will be sent the following day. We also offer international postage which the cost depends on the weight of your parcel, but may work out more cost effective than if you had to send the parcel on to the receipt at the Post Office. Let us wrap your gift for you for just £2.50. The present will be wrapped in the appropriate gift wrapping paper, tagged with your message and finished with curled ribbons. Please choose the gender that the present is for, the celebration style and the toy you would like gift wrapped in the boxes above.